How do we know when what is happening between two people should be called psychoanalysis? What is a psychoanalytic process and how do we know when one is taking place? 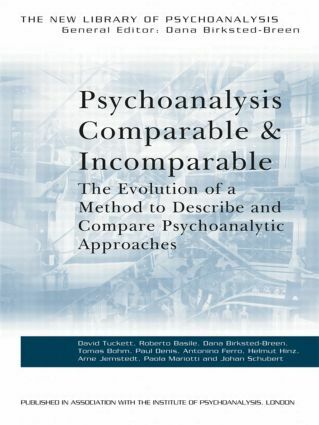 Psychoanalysis Comparable and Incomparable describes the rationale and ongoing development of a six year programme of highly original meetings conducted by the European Psychoanalytic Federation Working Party on Comparative Clinical Methods. The project comprises over seventy cases discussed by more than five hundred experienced psychoanalysts over the course of sixty workshops. Authored by a group of leading European psychoanalysts, this book explores ways for psychoanalysts using different approaches to learn from each other when they present their work to fellow psychoanalysts, and provides tools for the individual practitioner to examine and improve his or her own approach. As described in detail in its pages, sticking to the task led to some surprising experiences, raising fundamental questions about the way clinical discussion and supervision are conducted in psychoanalysis. Well known by many in the psychoanalytic community and the object of much interest and debate, this project is described by those who have had the closest contact with it and will satisfy a widely held curiosity in psychoanalysts and psychotherapists throughout the world. David Tuckett is winner of the 2007 Sigourney Award.